In 2014, the South Korean Navy paraded the Hyunmoo-3A, Hyunmoo-3B and Hyunmoo-3C cruise missiles, with a range of 500, 1000, and 1500 km. On 1 October 2013, South Korea held a massive military parade mainly to celebrate the 65th anniversary of the founding of its armed forces, but also to deter provocations from North Korea. 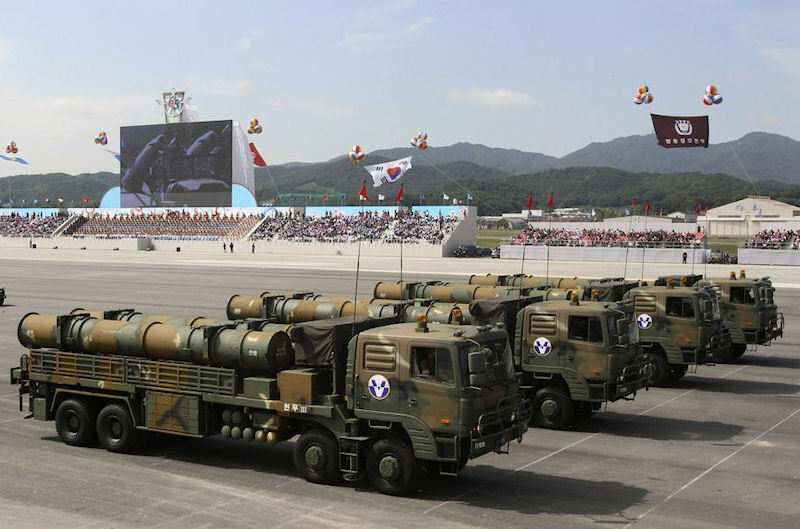 During the parade, South Korea publicly displayed for the first time locally-developed missiles capable of precision strikes in North Korea: the Hyunmu-2, with a range of 500 kilometers, and the Hyunmu-3, with a range of 1,000 kilometers. Hyunmoo III (Hyunmoo was also written Hyunmu) was a new cruise missile that was to be fielded with the military of Republic of Korea. It was designed by Agency for Defense Development. The name Hyunmoo came from a mythical beast described as the "Guardian of the Northern Sky". Hyunmoo III bore no resemblance to the previous Hyunmoo surface to surface missile, though it was initially reported to be a derivative of the latter, which were improved versions of Nike Hercules surface-to-air missiles that were converted into short-range high-speed surface-to-surface ballistic missiles in response to North Korea's Scud-B and Nodong-1 missile threats. The Nike Hercules-based missile, developed by the state-run Agency for Defense Development (ADD), had a range of only 180-300 kilometers. Hyunmoo IIIA, which was nicknamed "Eagle-1" during the testing, had a range of 500 kilometers, while Hyunmoo IIIB, nicknamed "Eagle-2", had a range of 1,000 kilometers. Hyunmoo IIIC, or "Eagle-3", would be capable of striking its target up to 1,500 kilometers away. The Hyunmoo IIIC was eventually described as a ground to ground vertical launch cruise missile with a 53-60 centimeter diameter and a length of 6 meters, weighing in at 1.5 tons with less than a Mach-1 capability and a warhead of less than 500 kilograms. It was also subsequently reported that the 500 kilometer ranged missile had been designated as Hyunmoo II, while the 1,000 kilometer range missile was designated Hyunmoo III. On 7 July 2006, Defense Minister Yun Kwang-ung said that South Korea had "tested cruise missiles probably more than ten times over the last three years." The latest test apparently was conducted in December 2005. Yun also said the United States had been aware of ROK's cruise missile development program. The new Ch'onnyong ("sky dragon") cruise missile was reported to have a range of 500 kilometers and to have a circular error probable of 3 meters. South Korea planned to increase the missile's range to 1,000 kilometers by 2007. In the final quarter of 2006, Korean sources reported that Seoul was developing a land-attack cruise missile designated Cheon Ryong (Sky Dragon) or Hyunmoo. The first test firing of this weapon took place on 25 October 2006. Its range was thought to be 800 nautical miles (1,500 kilometers). In October 2006 a government source revealed that the ground-to-ground Hyunmoo III had a range of 1,000 kilometers and the Hyunmoo IIIA had a range of 1,500 km, the air-to-ground Boramae (Falcon) a range of more than 500 kilometers, and the ship-to-surface and submarine-to-surface Chonryong had a range of more than 500 kilometers. It was the first time these details were made public. The Chonryong was expected to be the primary weapon of the The KDX-III vessel, which had 128 missiles on its vertical launch system. This was 32 more than the US Arleigh Burke class or the Japanese Atago class. 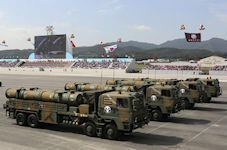 More than 30 of "King Sejong the Great's" missiles would be Chonryong cruise missiles. Other armament would include 10 "Hongsango" or "red shark" anti-submarine missiles that would cover at least 19 kilometers. By 2006, it was reported that the South Korean military and the state-run Agency for Defense Development (ADD) succeeded in developing the Hyunmoo III and were already deploying some at an unnamed base. Significant progress in developing the Hyunmoo IIIA had been made, with the variant extending the Hyunmoo III's range to 1,500 kilometers. That meant it would be capable of hitting anywhere in North Korea, as well as a significant number of major targets in neighboring countries, including Tokyo and Beijing, improving the country's strategic strike capability. In late 2007, it was reported that South Korea had developed a cruise missile with a range of 1,000 kilometers that could reach as far as Beijing and Tokyo, as well as hit any target in North Korea. The Army's missile command possessed the cruise missile with a range of more than 1,000 kilometers. 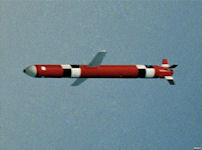 In 2006, a government official revealed that the military successfully tested the cruise missile. The missile could hit targets with a margin of error of plus or minus 5 meters aided by a Terrain Contour Matching (TERCOM) system. The ROK military already had an advanced ship-to-surface Chonryong cruise missile with a range of 500 kilometers. South Korea had joined the Missile Technology Control Regime (MTCR) in 2001. The MTCR regulated international transfers of ballistic and cruise missiles able to carry a 500 kilogram payload to a range of over 300 kilometers. The MTCR did not prohibit members from producing such missiles. The agreement with the US prior to 2001 prevented the ROK from developing such missiles, but the ROK proceeded regardless of the agreement. The US never agreed to the development of these long-range missiles. The US policy had generally been to not provide the ROK with offensive weapons. The 1,000 kilometer cruise missile could not be interpreted as a defensive weapon simply against the North, but also encompassed Japan, China and Russia. The 1,500 kilometer cruise missile under development made this attempt to develop an offensive capability unmistakable. South Korean army Major General Shin Won-sik, briefing domestic defense reporters at the ministry on 19 April 2012, announced that South Korea was deploying a new cruise missile capable of hitting targets anywhere in North Korea. General Shin did not name the newly deployed missile. Analysts say it was the surface-to-surface Hyunmu 3C (also referred to as the Chollyong), reputed to be able to strike a target with two meters accuracy while carrying a 450-kilogram warhead. South Korea had also released a video showing its new cruise missile destroying a target along with a simultaneous warning, in which it vowed to "firmly and thoroughly retaliate" if North Korea conducts further provocations. The General said the new missile has a range of more than 1,000 kilometers and could immediately strike anywhere in North Korea. The deployment announcement came less than a week after North Korea tried to launch what Seoul and Washington characterized as a Taepodong-2 long-range missile.